Or at least, become a better horror filmmaker. I'm in my third year of reviewing films for the Tabloid Witch Awards, sponsored by the Hollywood Investigator. It's an easy contest to enter; any short or feature length horror film is eligible, no entry fee required. Thus, I've received entries from across the spectrum of experience, from camcorder hobbyists, to film students, to professionals. I also see the same recurring mistakes among the losing films. Yet they're easy enough to avoid. Follow the below rules, and your film should be far more competitive in any festival you enter. "If it ain't on the page, it ain't on the stage." If you insist on writing your own script, you must study the art of storytelling as seriously as you'd study your camera. Too many filmmakers think screenwriting is only about format. Too many directors want to be "auteurs" and write their own scripts without learning the art of storytelling. I've seen too many entries that confuse the two. "X rises from the grave and kills Y. The End," or "Zombies eat people. The End." Nor should you rely on a (often predictable) twist. "X is a serial killer who dates Y who turns out to be a vampire. The End." I've probably seen over a thousand horror films and TV shows so I know every "surprise" ending. Festival screeners tend to be well-versed in cinema history, especially in their festival's genre, so don't rely on your film's ending. You need more. Tell a story. And if you don't know what that is, see Rule 1. Even a good film can be ruined by fat. Rich Mauro trimmed Mole to its perfect length. Distributors had advised Mauro that a one hour feature was a hard sell, but Mauro chose the best length for his tale of reporters seeking "mole people" in the abandoned subway tunnels under Manhattan. And it worked. Apart from winning a Tabloid Witch for Best Horror Feature Film (and Best Actress, and Best Supporting Actor), Mole also found distribution as part of a four film horror DVD package. Jamie Renee Williams's Slinky Milk (Honorable Mention), a black and white surreal film reminiscent of Un Chien Andalou, was intriguing at its five minutes. Were it a half hour, it would have overstayed its welcome. I've seen many losing entries that would have been stronger at half their lengths — films sabotaged by overlong expository shots, or directors in love with shots that fail to contribute to the story, or characters wandering around or engaging in pointless chatter. If a line is unnecessary to the story, don't say it. And if a line is necessary, say it in a way that's sharp, funny, clever, intriguing, memorable, or interesting. Dialogue should reveal character or move the story forward. Characters should not sound alike. Vapid chatter that achieves nothing may sound realistic, but banal banter makes for a dull film. Acting quality was the single biggest element separating winning films from the losers. Actors who are wooden, self-conscious, affectatious, or chew scenery can tank an otherwise decent film. I rejected one film that did a decent job of recreating the 1860s, in costumes and furnishings, only to populate this period piece with some painfully bad acting. There's no excuse for this. Big cities teem with trained actors willing to work cheap, or even for free. And even small towns usually have a college or community theater with trained actors. Of course, I've also seen horror "parodies" in which I suspect the director thought his bad cast was an asset. Wrong. An amateurish cast rarely produces a film that's "so bad it's good," but more often a film that's "so bad it's unwatchable." If you still insist on casting your friends and family, insist they get professional training. Seriously. Otherwise, you're shooting a home movie, and home movies can rarely compete against polished work. Mole, Legion, and Human No More all underwent extensive post-production to optimize their camera footage. The results were beautiful, with Legion (Best Horror Short Film, Best Visuals, and Best Supporting Actress) resembling such studio fare as Lost Souls in its dark and moody cinematography. On the low end of the scale, many losing entries had a flat "home video" look: poorly lit, with dull, fading colors. Yet post-production needn't be prohibitively expensive. Human No More achieved its impressive visuals with Final Cut Pro. George Lucas understood this, which is why he founded Skywalker Sound. Christopher Alan Broadstone also understands this, which is why his Human No More (Best Sound, Best Actor, and an Honorable Mention) is a densely layered audio feast. And he did it with off-the-shelf computer programs like Bias Sound Soap and Bias Peak 4. It didn't require much money, only much effort. Rules can be broken. Human No More is a vignette rather than a story. And Slinky Milk has no story and no trained actors. But Broadstone's film remains powerful because of its artistry and originality; and Williams's experimental genre doesn't require a story or acting. Even so, rules are rules because they usually work. Violating them is a risk that rarely pays off. While skillfully shot and acted, Cadaverous and SuperStore are conventional horror tales of no great originality. Yet each won an Honorable Mention because, while we can predict their endings, these films maintain our interest. They entertain us. The writing contains no fat and the story moves at a good pace. We are not bored or driven off by an amateurish cast. These eight rules are simple to understand, but require much study and effort to master. However, a film that is well-written, well-acted, with beautiful visuals and a clear soundtrack, and is entertaining to boot, will more likely win an award. What Does It Take to Win a Tabloid Witch? Some past Tabloid Witch winners have placed their short films on YouTube. You can see their winning films at the bottom of the pages for 2004, 2006, 2007, 2008, 2009, and 2011. How do YOUR films compare? 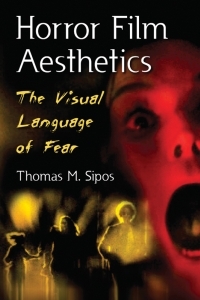 We recommend Horror Film Aesthetics, written by Tabloid Witch Awards founder & director Thomas M. Sipos. This book is about the aesthetics of film (as opposed to the technical stuff). Many self-taught filmmakers ignore aesthetics, concentrating solely on the technical elements. This book is neither "artsy fartsy" nor "dummied down." It's written in an intelligent, yet accessible prose style. It's perfect for smart filmmakers who know how to use a camera (i.e., which buttons do what), but want to learn how to use their cameras well. You might also learn something about film aesthetics in one of our recommended blogs (left). 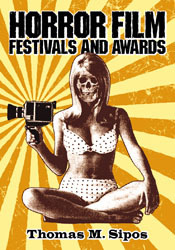 We also recommend Sipos's Horror Film Festivals and Awards, for an inside peek "behind the scenes" at dozens of horror film festivals -- and listings for over 200! "Hollywood Investigator" and "HollywoodInvestigator.com" and "Tabloid Witch" and "Tabloid Witch Award" trademarks are currently unregistered, but pending registration upon need for protection against improper use. The idea of marketing these terms as a commodity is a protected idea under the Lanham Act. 15 U.S.C. s 1114(1) (1994) (defining a trademark infringement claim when the plaintiff has a registered mark); 15 U.S.C. s 1125(a) (1994) (defining an action for unfair competition in the context of trademark infringement when the plaintiff holds an unregistered mark).